the aqua blue waters go on forever. 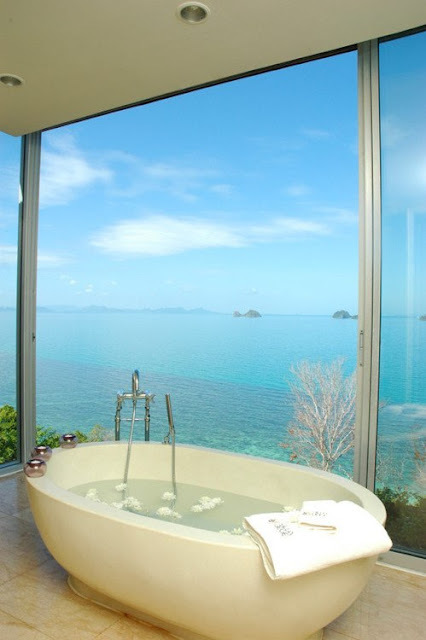 Which do you prefer, last week`s tub with a view or this one? I would spend hours taking a bath. Of course most of that time is spent gazing out. Me too, my fingers would end up looking like raisins. i wish I had a tub like that!! would spend there my days !! Absolutely positively without a doubt this tub with the view of aqua blue waters! Hahaha, absolutely positively me too! Forget the rest of the house, I could just live in that bathroom! Celebs in tubs: Ciao Jersey Shore! Can`t keep cats out of sinks!